Andrew’s Baby Welcoming Ceremony was inspired by the beginning of the fairy tale, Sleeping Beauty where everyone in the Kingdom came and offered the new baby a spiritual gift. 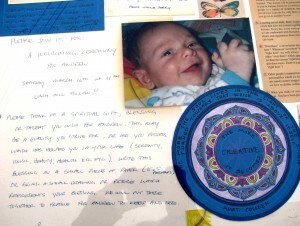 His family was invited to a party and asked to bring a spiritual gift, blessing or talent that they wished for Andrew. They could write this blessing on paper or a picture or drawing or some other representation of this gift. At the gathering each person presented their gift and explained what they wished for Andrew. This was a very touching and often humorous presentation, enjoyed by all. 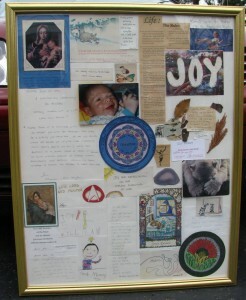 After the ceremony all of these gifts were gathered up, arranged in a framed picture which graced Andrew’s room all his life.